Normally, I avoid clichés like the plague. 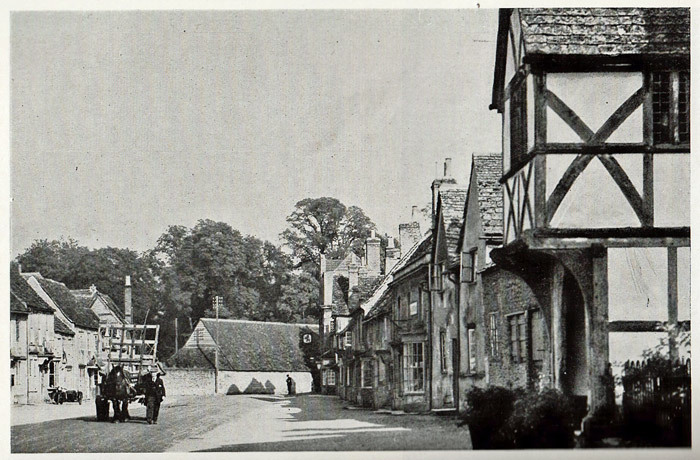 However, Lacock is one of those places that are almost frozen in another time; it really is. In this small Wiltshire village of about 350 souls, there are few overt trappings of the 21st century: no satellite dishes or TV aerials, very few yellow lines, and only a small amount of signage – which anyway appears to be easily removable. Take away the cars and rough-up the road surface a little and you’re transported back to the past, albeit a sanitised version where every building is immaculately maintained. 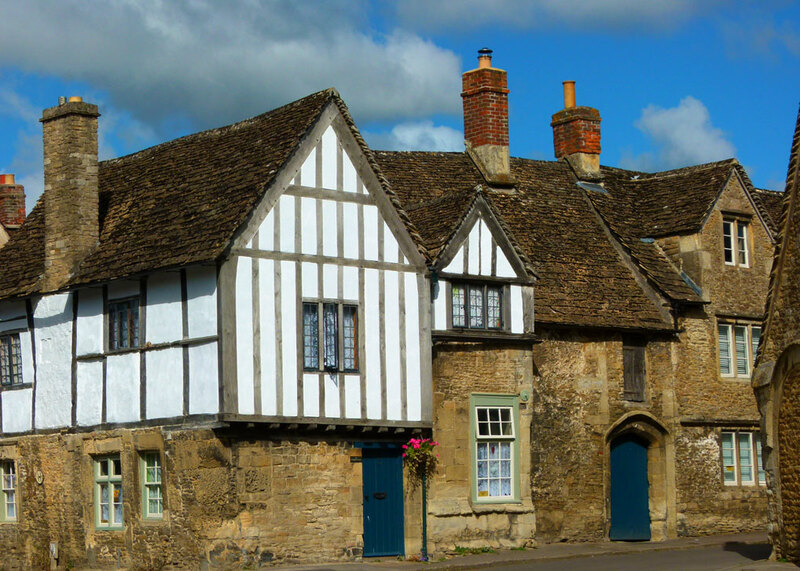 Which explains why Lacock is one of the UK’s premier locations for filming period dramas. Presumably, it also smells a lot better than our yesterdays did: technology hasn’t got round to transmitting olfactory experiences into our living rooms yet – and on balance I’d say that’s a Good Thing. So it seems that a production company rolls up, dishes out thousands of pounds – which is shared between the Parish Council and the National Trust (the NT owns most of the village) – and then goes about ‘dressing’ the streets to transform them into whatever place they require. This entails putting down a suitably ancient road surface (like mud) and possibly erecting some false fronts on some of the houses. You know how astonishingly realistic these productions look when they reach us. I assume the residents are given a few quid too, to make sure they don’t park their 4x4s (‘SUVs’) outside Mr D’Arcy’s Apothecary, or play ‘Women’s Hour’ too loudly at an inconvenient moment – say when the hero and heroine are puckering up for that first chaste kiss. Maybe some Lacockians go away on holiday when filming is taking place. Some take part in the action as extras, mayhap rubbing shoulders with the likes of Dame Judy Dench, Sir Anthony Hopkins or Daniel Radcliffe. You wouldn’t want to wash again, would you? After visiting Lacock, we hunted through the DVD collection to dig out as many dramas filmed there as we possessed, the intention being to watch all of them again; one at a time. You can imagine just how delighted I was to find that we had so many. How did that happen? Naturally, to avoid too much concentrated excitement, I endeavoured to string this new game out for as long as possible. I suggested we only watch an episode when there was absolutely nothing else worthwhile on TV, including the children’s and Arabic channels and the ones showing back-to-back repeats of Hawaii Five-O. Or perhaps alternate with evenings quietly darning by the fireside or catching up with complete strangers’ holiday snaps. But we seemed to visit the ‘Lacock Collection’, as I like to call it, with alarming frequency. My claim that we were watching the same ones over and over was briskly dismissed; yet surely there’s no similarity between the plots, characters or costumes of these things..? 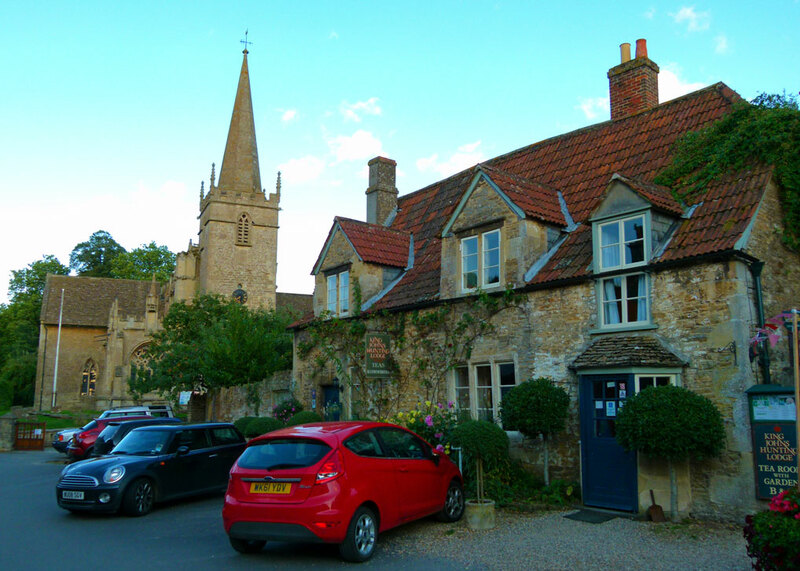 Anyway, amongst the productions filmed in Lacock have been at least two versions of Pride and Prejudice, including the one with Colin Firth and the fragrant Jennifer Ehle, when Lacock became the town of Meryton. Cranford, with Judy Dench, Michael Gambon, Philip Glenister and Francesca Annis was made there, as was Lark Rise to Candleford, the 1996 production of Emma with Kate Beckinsale, Moll Flanders, The Mayor of Casterbridge, The Woman in Black, The Wolf Man – the list is (apparently) endless. Up at Lacock Abbey (highly recommended), they have filmed scenes from at least three of the Harry Potter stories (Philosopher’s Stone, Chamber of Secrets and the Half-Blood Prince), as well as The Other Boleyn Girl. It wouldn’t happen in Croydon. 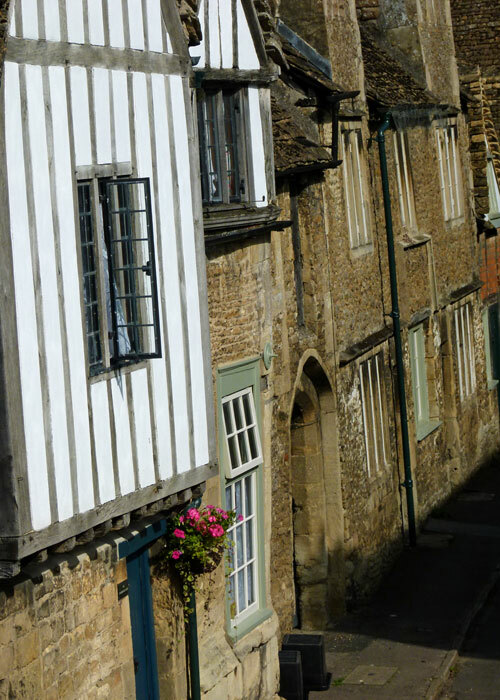 All that and jesting aside, Lacock is a visual delight: originally Saxon – Lacok, meaning ‘the small stream’ (854AD), it was mentioned in the Domesday Book (1086) as Lacoc. The village later grew alongside the abbey, flourishing as a wool producer conveniently located along the route between London and Bath. 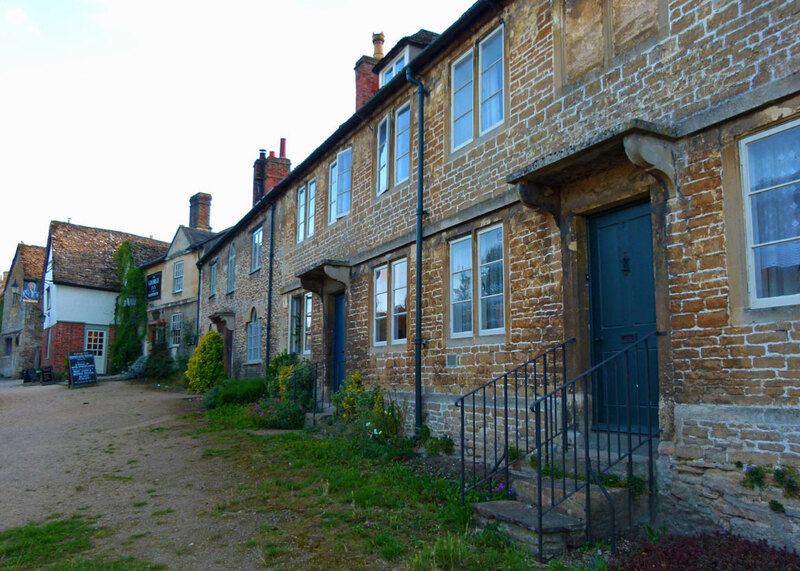 Most of the houses are 18th century, or earlier; nothing new has been built in the last 200 years. 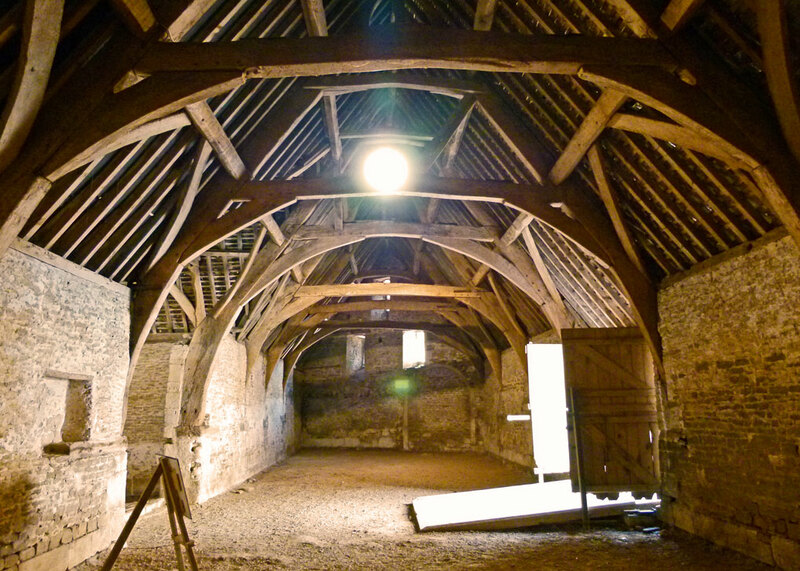 There is a 14th century tithe barn, where villagers would deposit their ‘tithes’ – a tenth of their produce, donated to the relevant landowner – in this instance, the abbey. The parish church of St Cyriac is simply wonderful. The buildings are mainly constructed in limestone, with stone-tiled roofs, and some timber-framing. It’s charming, with a number of shops – including the inevitable National Trust Emporium of Things Nobody Really Needs (except, of course, for that rather fetching scarf I’m wearing) as well as a couple of establishments mainly selling, frankly, tacky rubbish. There is a scrumptious bakery, though, and a very respectable jewellery store, which offers reasonably-priced costume baubles as well as more expensive items. It’s also commendable and somehow convivial that the locals sell fresh produce outside their homes, on an honesty-box principle. I was particularly attracted to an enterprise intriguingly called, “Quintessentially English” (purveyors of all things beautiful), but was rather disappointed to discover it sold home-made soaps and such; nothing wrong with that, but I don’t see what’s “Quintessentially English” about personal hygiene and can’t help feeling the allusion might upset all those dirty foreigners. It smelt great, though. 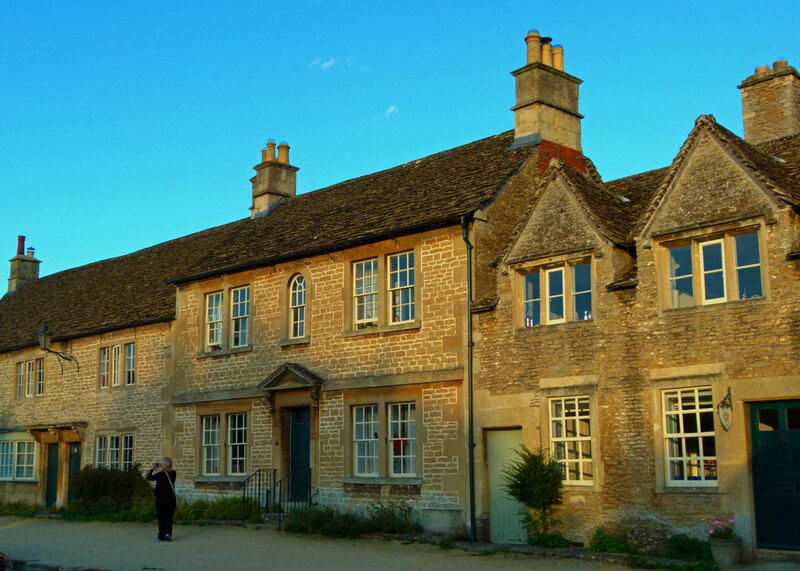 Adjoining Lacock village is Lacock Abbey and the Fox-Talbot Museum of Photography. A fit person like my reader can probably tour the whole lot in a day. But there are at least two tempting pubs, the George and the Red Lion, either or both of which could slow you down. The missus and I spent a very comfortable night at the Red Lion, and I particularly enjoyed a couple of very respectable pints of Wadworth’s 6X sitting warmly outside in the shade of a rather impressive eucalyptus tree. 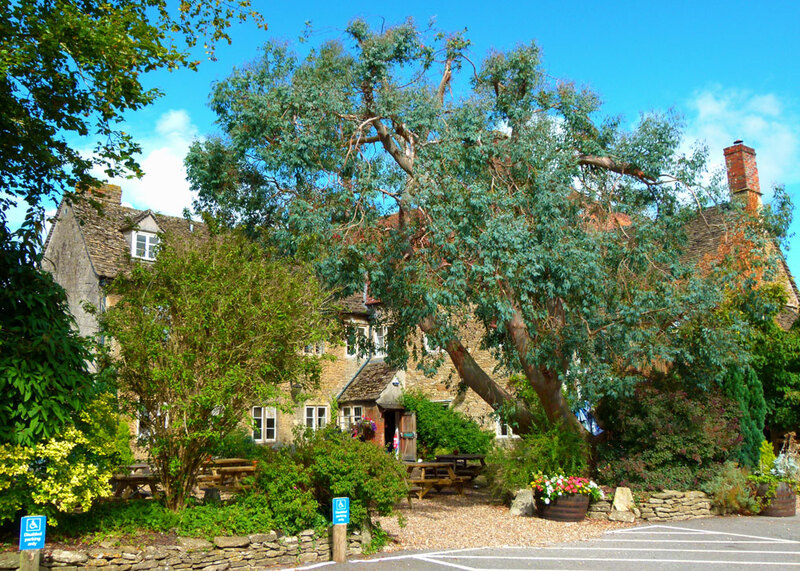 There are also various other places to stay, and eat, including one called King John’s Hunting Lodge, which is allegedly the oldest building in Lacock, dating back to the 13th century: I’m not sure if it was either a hunting lodge, or used by King John, though. Just bear in mind that Lacock is a popular place, so be prepared to do battle with stampeding coach parties, many armed with zimmer frames. And be wary of dewy-eyed enthusiasts dressed as heroines from Jane Austen’s novels; it’s a truth universally acknowledged that they’re either actresses, nuts, or in search of some bloke in possession of a good fortune. Oh, I don’t think that’s unique to the US – many of our towns are like that too! 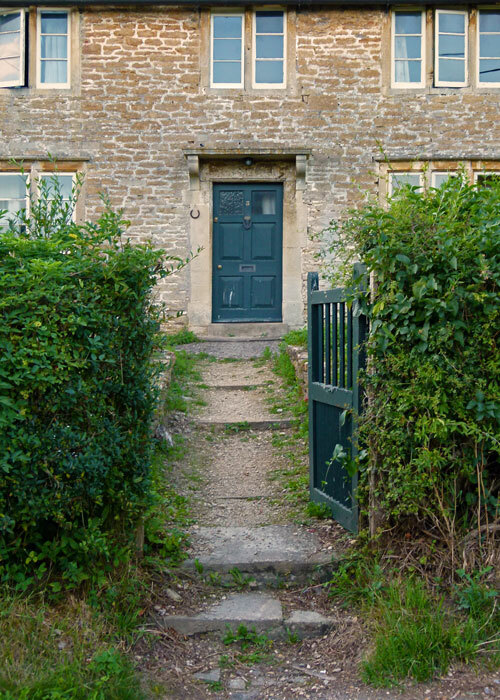 Lacock is a peach; another one nearby is Castle Combe – tell your notes to take you there as well. A visual delight–oh yes. I love the interior shot of the barn(?) with the intricate beams. Amazing construction. I have many of your Lacock series films, so will have to go back and take a closer look. I had to laugh at your comment about Hawaii Five-0 reruns because both times I visited Diamond Head in Honolulu, we found ourselves smack in the middle of the filming of Hawaii Five-0 episodes. Not exactly Lacock. Yes, it’s a tithe barn. If you visit again – and I hope you will – you should find an explanation appears if you hover your cursor over a photograph. I used to love Hawaii Five-0 – TV crime programmes are a little grittier now! You are lucky to have visited Hawaii – stunning. I can totally see why the urge to watch one of the movies made here after a visit Mike, I must admit to seeing most of the movies you mentioned , I mean, no one does romantic period films like the British! I hadn’t realised so many period dramas were filmed in Lacock, though it’s hardly surprising. Also popular among filmmakers is the village of Chilham in Kent, near which I lived for many years. It played host to the 2009 production of Emma and the 2005 Pride & Prejudice. As a bonus, Austen herself even visited when staying with her brother who lived at nearby Goodnestone Park. Worth a visit, also with some pleasant countryside in the Stour Valley. 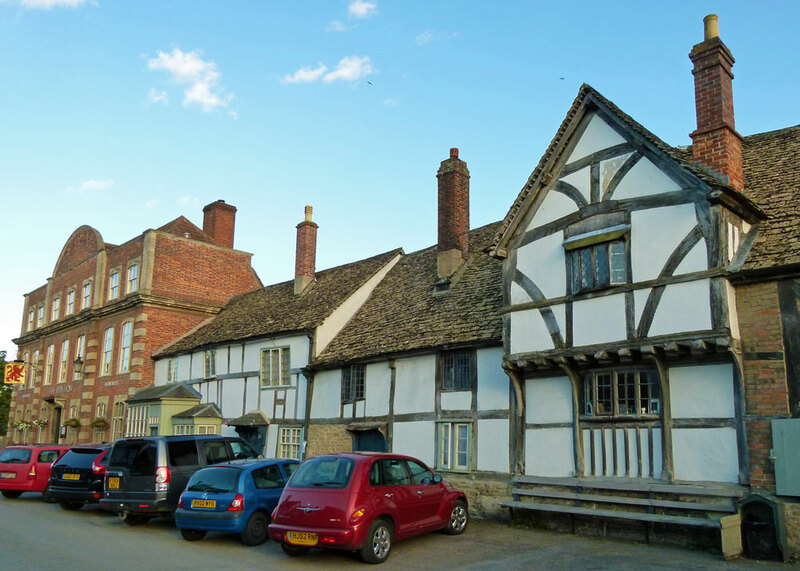 I often used to visit Chilham – it’s lovely. What great shots. The architecture is delightful! I have wonderful memories of visiting Lacock (twice) and now thanks to your post, I know what I’ll be watching every evening until Christmas… A movy filmed there from your long list! What a lovely place, Lacock. I remember visiting there in 1999 and enjoying walking around, the tea room and feeling as if we went back in time, I didn;t realize so many movies had been filmed there. Now I will pay special attention to the venue when I watch those movies again. Just lovely Mike and beautiful photos as always. It very much reminds me of Corfe Castle which I love. I’ll have to put Lacock on my’ places to visit’ list! A place I’ve not visited but it does look and sound very nice. You managed to get some good pictures … without the crowds … well done. Well, since we have all the mentioned movies and series, I guess I will watch them yet again and drink in Lacock. Seems too wonderful to be true. I like your photos (sans zimmer frames) and prefer to think it looks like that all the time. Thank you again for a wonderful narrative. Lacock is always well worth a visit. I particularly like the Abbey with its cloisters and garden. Last time I went to Lacock, which was a long time ago, they had a scarecrow competition. Somewhere or the other I have a very fine picture of a Fat Controller scarecrow – I don’t suppose “Thomas the Tank Engine” was among your “filmed in Lacock” movies, was it? Sounds more like a movie set than a real village. Glad that you found an interesting old set of buildings underneath it all. And I gather that you’re not a big movie buff, just like myself. Yet another place we haven’t visited yet. We have quite an extensive Lacock collection too! 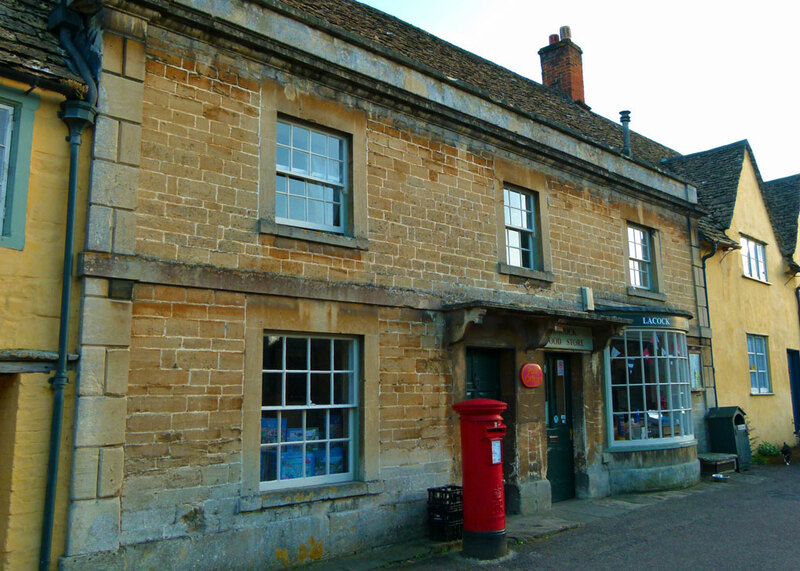 Lacock looks absolutely charming! This is the kind of village that makes me gush. 🙂 I love the blue doors and all the different-sized windows. The tithe barn is beautiful, and so is the church. 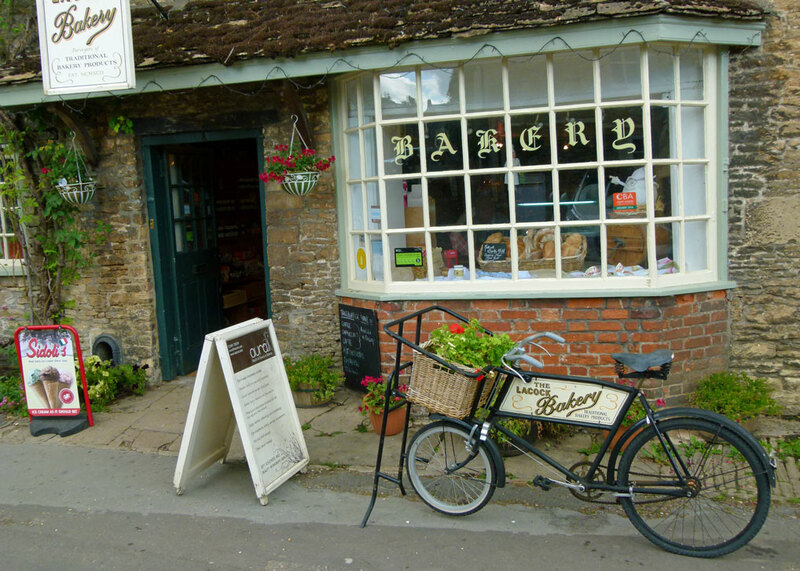 Would love to visit the bakery and King John’s Hunting Lodge! Thanks for sharing these great pictures with us. 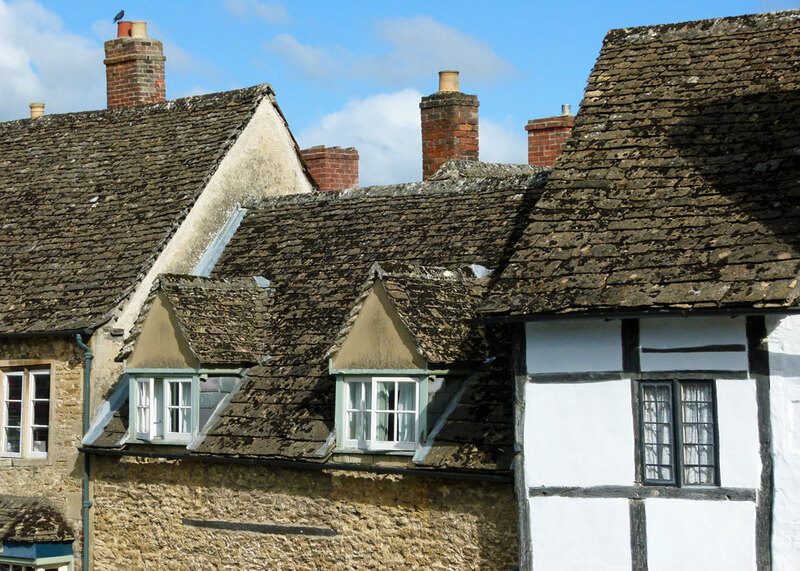 I enjoyed touring Lacock and would love to see it in person someday. Have a good weekend! It sure looks like stepping into a time machine with Dr Who and going back to those days. I doubt I will ever get there so thanks for showing us around. Love your humour jazzing up the history lesson. Had to see Lacock, so many of my favorite shows were filmed there. It did not disappoint. “It wouldn’t happen in Croydon”. Poor Croydon, my husband’s birthplace! I think I have seen all of the movies and TV shows that you have mentioned here. Gee, I watch a lot of British stuff! Ha! We thought about visiting Lacock when we headed to Cornwall but we didn’t have the time. We zoomed across the country too much for my pleasure. I’m a huge fan of Cranford and Pride and Prejudice and it’s about time to re-visit those series. We are also Harry Potter fans. Have fun viewing your favorites…again. Having had seen some of those movies, yes, this place is familiar to me. Looks like a lovely place to visit! Especially the pub. This Yank is longing for a place like this. I’m over-the-top with the fast-paced and congested environment. I wonder if they’d welcome a quiet, country walk-prone writer in their midst?